Easing the transition to nursery school « Howard J. Bennett - Pediatrician and Author in Washington, D.C. Many children have difficulty separating from their parents when they begin nursery school. My wife came up with a terrific idea to help our son adjust to school. First, she asked the director for a class list two months before school began. Then she called all of the parents on the list and invited them and their child to a Sunday morning play session at the school playground. She told parents that she would be there with our son every week, but that other people could come whenever they wanted to. By the time school began, our son had met everyone in his class and knew half of the children pretty well. His transition in September was much easier than his mom or I would ever have predicted. 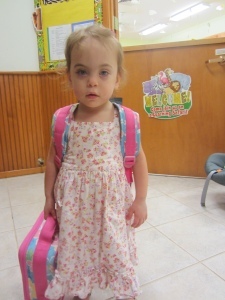 This entry was posted in Dr. B's Blog and tagged child development, school.